Jessica Shaw is a Maine RecoveryCorps coach who works at the Columbia Street Project in Bangor. Shaw and other RecoveryCorps coaches will support people facing substance abuse disorders, with an emphasis on opioids. She has struggled with substance abuse issues and now that she has been clean and sober she wants to help others who deal with similar issues. Jessica Shaw knows about being in tough places and how critical a helping hand can be when you’re trying to get out of one. That’s why she’s working more than full time to reach out to people seeking to recover from substance abuse disorders. 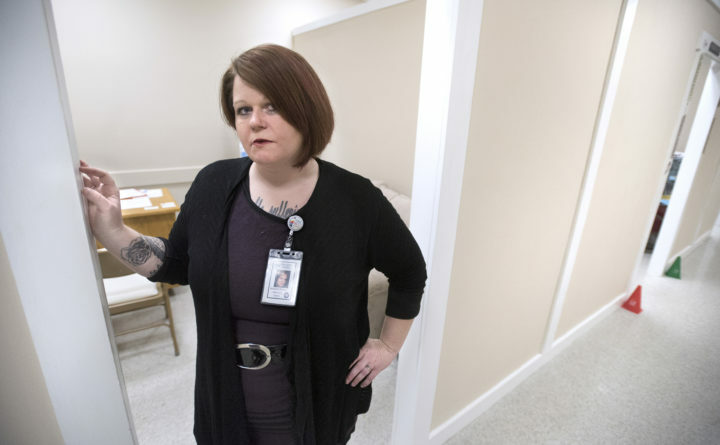 The 37-year-old from Bangor, who has been sober for 2½ years, is a coach with the new Maine RecoveryCorps. She spends her days — and a lot of other hours, too — helping people who struggle with addiction solve problems and move forward in their lives. The program she works for eventually will have 30 coaches like her spread out across Aroostook, Hancock, Knox, Penobscot, Waldo and Washington counties. It is funded by a three-year AmeriCorps grant that is managed through Healthy Acadia, a nonprofit community health organization based in Ellsworth. Sonia Turanski, the program manager for the Maine RecoveryCorps, said that Healthy Acadia was awarded nearly $300,000 from AmeriCorps at the end of last summer to train and support the coaches, who typically have experienced substance abuse disorder and recovery themselves or through someone close to them. They will work at host sites that include the Columbia Street Project in Bangor and the Maine Coastal Regional Reentry Center in Belfast. Full-time coaches receive a living allowance, an education award, health insurance, mileage, training and more. Part-time coaches work six to eight hours per week and receive much smaller stipends, education grants and the rest. People who are 55 years old or older at the time of their service can transfer their education award to a child, grandchild or foster child. Often, that looks like finding folks practical help with food, clothing, housing, transportation or access to resources, she said. Recovery coaches don’t replace sponsors or other kinds of counselors but play an important supporting role all the same. Those are all things that Shaw tries to be for the dozen or so people she works with every week. One of her “recoverees,” as they are called, stopped using all substances more than a month ago but was stymied in her quest to get an apartment. She had been couch-surfing since August and needed a permanent address to get Supplemental Security Income checks sent to her, but couldn’t get a permanent address without any income. She knows from her own experience how hard it can be to get to a better place. She started using drugs when she was 12 years old, and the first time she tried to attempt recovery, she walked into a doctor’s office with her baby son and asked for Suboxone, a prescription drug that can reduce symptoms of opiate withdrawal. Eventually, she did find more help and got onto methadone, a synthetic opioid used to treat opioid addiction. Later, she joined a 12-step program that she credits with helping her quit everything. She also gives credit to a compassionate DHHS caseworker and her strong faith. It was not a smooth recovery journey, so she understands how other people struggle, too, she said. The work of the recovery coaches aims to improve outcomes in Maine’s fight against the opioid epidemic, Turanski said. For more information about the program or about becoming a RecoveryCorps coach, call Sonia Turanski at 207-667-7171, ext. 228, or by emailing her at sonia@healthyacadia.org. Correction: An earlier version of this report stated that recovery coaching services would be available at Hancock County Jail. That possibility has yet to be confirmed.